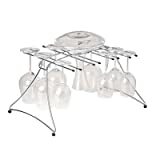 Oenophilia Fusion Stemware Rack – 16 Glass – My Home Wine Bar ! Amazon Price: $35.99 $29.99 You save: $6.00 (17%). (as of February 2, 2019 4:06 am - Details). Product prices and availability are accurate as of the date/time indicated and are subject to change. Any price and availability information displayed on the Amazon site at the time of purchase will apply to the purchase of this product. Designed to hold 16 glasses plus a decanter, the Oenophilia Fusion Stemware Rack is great for air-drying your glassware, and for displaying it too. Its striking design and amazing functionality makes this rack the perfect tool for cleaning up after your dinner party or wine tasting. The Fusion Rack is is durable and features a chrome finish, with protective balls on the feet, so it won’t scratch your counter. The legs fold flat for easy storage.